Also known as Peruvian Ginseng, Maca (Lepidium meyenii) is grown in the high plateaus of the Andes mountains in Peru. The roots are carefully selected then washed before they are cut, cooked, dried and made ready for milling. Maca is beneficial to men and women of any age, but especially those over the ages of 30 when hormone levels decline. In men, maca is used to promote healthy testosterone levels, which helps improve strength, vitality, hair health, higher bone mass density and sexual drive. In women, maca supplementation has been studied to help normalize the symptoms of premenstrual/menstrual symptoms as well as the symptoms of menopause including hot flashes, night sweats, cramps, fatigue and lethargy. 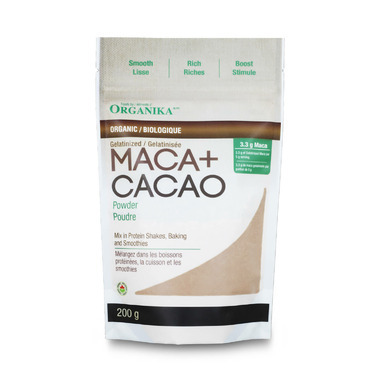 Organika® Organic Gelatinized Maca Powder undergoes a specialized procedure, involving additional slow cooking and an extrusion process which splits large starch chains. This process creates a powder that blends easily and instantly into your favourite food. Packed with antioxidants and energy. Cacao has more antioxidants than Red Wine, Green Tea and Blueberries combined. Directions: Take 1 heaping teaspoon a day, added to water, coffee, or your favourite beverage. Love the maca & cacao combination. This makes a nice natural alternative to hot chocolate mixes, which I no longer purchase due to the insane amount of chemical fillers in the ingredients. Nice tasting and I love adding it to my coffee for an extra flavour & nutritional boost. Will definitely purchase again. Love the flavour. I usually add this to smoothies or even to my coffee in the morning. Only been using for a couple of weeks but I already know that I will reorder when I'm out. This is one of my favourite go to treats at work. I use it as hot coco. No guilt! Love it and will keep on buying it.